David Brown, president of Harrington Brown, LLC, speaks at a Plan Commission meeting Wednesday. The commission voted 5-1 to recommend City Council’s approval for a building at 128-132 Chicago Ave. 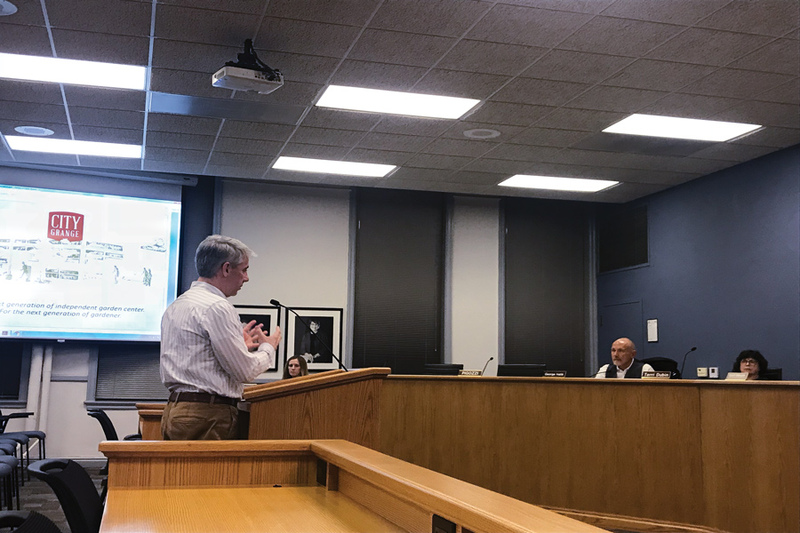 The Evanston Plan Commission decided at a Wednesday meeting to recommend that the City Council approve a five-story mixed-use building at the border of Evanston and Chicago. Commissioners voted 5-1 to approve the proposal, allowing developers to move forward with the plan for the building at 128-132 Chicago Ave. with some building allowances and a map amendment. The building features both retail and living space with plans for several garden spaces, a cafe and coffee shop as well as a bee apiary. David Brown, president of Harrington Brown, LLC., said the development will brighten a “underutilized” and “blighted” site. The building —- what Brown called the first education- and garden-based lifestyle center in the country — will include 26 residential units, five of which are affordable housing units, along with a teaching garden and an organic plant yard. The cafe will serve organic, locally sourced food. City Grange, a social enterprise garden center set to open with the complex, will run the gardening component of the building as well as some workforce training programs. LaManda Joy, the president of City Grange, said she plans to work with GirlForward — an organization that provides opportunities to girls who are refugees — and similar groups to provide jobs that could lead to careers within the horticulture industry. Joy said City Grange is an evolution of her nonprofit, the Peterson Garden Project, which organizes community gardens in Chicago. She added that City Grange is a separate for-profit business, but still has a similar goal of teaching people how to grow organic food. To comply with the city’s Inclusionary Housing Ordinance, Brown proposed an alternative equivalent proposal of five affordable units to households with earnings at 80 percent Area Median Income, according to city documents. The documents state that the ordinance requires the developer to either provide five affordable units to households with earnings at 50 and 60 percent Area Median Income or make a fee-in-lieu payment of $500,000. Brown said there was a desire from the beginning of the project to incorporate affordable units into the building, so the developers wanted to submit an alternative equivalent proposal rather than make a fee-in-lieu payment. Rainey, who attended the meeting, said the area is “self-supporting” and the units will be beneficial to the neighborhood. She added that this proposal “beats anybody else’s affordable housing plan” and will bring life into that area of her ward. An article titled “Plan Commission recommends mixed-use building” in Thursday’s paper misstated Sue Loellbach’s position at Connections for the Homeless. She is the manager of advocacy. The Daily regrets the error.